Arrival at the airport and transfer to the hotel. Optional Early Check-In. Optional: City tour by bike in Montevideo. Transfer towards Minas to the Posada de Campo La Salamora. En route visit to the small village Villa Serrana and the Valle del Hilo de la Vida. The valley is lined by a mountain that resembles a half moon. On top of the mountain one finds little towers made of stones. Dinner at the hotel (without beverages; lunch at the hotel depends on arrival time). Day at leisure. Possibility to participate in activities offered by the hotel (not all activities are included). Transfer to the Posada Valizas. Full day excursion using jeeps to cross the dunes to get to the village of Cabo Polonio. Time to visit the lighthouse and sea lion reserve. Transfer to La Pedrera visiting the “Palmares de la Coronilla”, Punta del Diablo and the “Bosque de Ombúes” on the way. Transfer to Punta del Este. On the way there visit to the artisanal women fisheries in Rocha Lagoon, APALCO (Asociación de Pescadores Artesanales de las Lagunas Costeras) with the possibility to see the lagoon of Rocha, home to numerous bird species and other animals. Afterwards visit to Alto de la Ballena, one of Uruguay’s most impressive start-up wineries, including a wine tasting. Day at leisure. Optional: City tour Punta del Este including visit to Ralli Museums and Casapueblo or City tour by bike in Punta del Este. Transfer to Montevideo and visit to the wildlife reserve Indígena in Solís en route, where native flora and fauna are protected, and which shelters diverse ecosystems, such as grasslands, native forests and wetlands. Transfer from the hotel to the bus terminal Tres Cruces. Journey from Montevideo to Colonia by public bus (without local guide). Upon arrival a guide will welcome a guest and show them the surroundings on a city tour. Afterwards some leisure time before getting back to the hotel. Visit to the wineries Irurtia and Cordano in Carmelo, to get to know the facilities and the local process of winemaking and to have a winetasting. Full day excursion to Fray Bentos, once called the “Kitchen of the World”. During the stay the Anglo Meatpacking plant and the Museum of the Industrial Revolution, such as the main square and the water front promenade will be visited. End of the roundtrip. 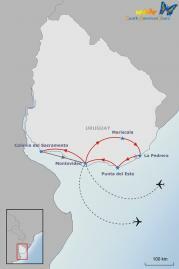 Possibility to take a ferry to Buenos Aires or a bus to Montevideo for return or onward flight.